I’m not Italian. I don’t make traditional Italian food. No little grandma to show me about marinara here, but I do love to tinker with the fare at home. Like a lot. Like when the holidays come around, and movie nights, and vacation fantasies, and pretty much every cookbook I browse at the bookstore. So, behold some of my tinkering: a mix of Rachael, Ina, Alton, and Giada’s versions (yes, at home I pretend we are all on a first name basis) – A muddled reinvention of their recipes all combined into something my husband and kids devour with delight. If you are Italian, just shake your head and grin….or feel free to adopt me and set me straight. My favorite part of tomatoes and basil coming back in season. My favorite salad. 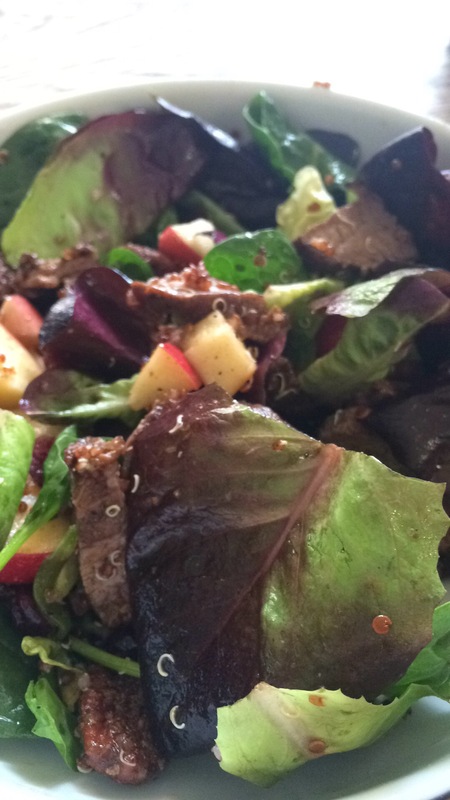 Drizzle with a syrup like balsamic….mmmmmmm. Sauces are one of those times when making from scratch really pays off. They are one of the first things you learn in cooking school and well, tomato is a mother. Take that any way you want. To make: Heat the olive oil in a large Dutch oven or skillet. 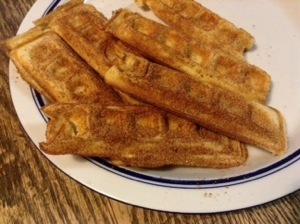 Sometimes I toss in a small pad of butter for good measure (and to keep my cholesterol up). Add onion and sauté over medium heat until translucent. Then add the garlic and cook for a minute or two more. Add the wine and increase the heat so the mixture is boiling away. Scrape up all the brown bits in the pan and cook until almost all the liquid evaporates. Add the tomatoes, herbs, salt, sugar, and peppers. Cover, and simmer on low for about twenty minutes. 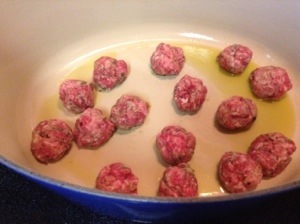 If you are braising the meatballs, add them in before you cover it. I’ve made these with lean sirloin, ground turkey, and a mix of beef and pork; with spinach and without. They are delightful any way. To make: Be gentle with the meat and mix it just until everything is well combined. If you make large meatballs for a sub, cook 20 minutes at 400 and lower the oven to 300 until cooked through. If they are medium for pasta, bake 20 minutes at 400. Man likes me to sear them on the stove and braise them in sauce until finished. This probably takes an hour or better. Now what to do with all this awesomeness??? Make some spaghetti and play old school Italian dinner by inviting the family. Pull up some TV trays and watch a mob movie, or if you need G-rated Lady & The Tramp. Grab some hoagies and provolone, put those meatballs on display and make subs! Sauté up some Italian sweet peppers and onions, grab a bun and some good Italian sausage & make Italian dogs. Freeze the leftover sauce and throw together a quick penne with peppers for meatless Monday. An easy but elegant chicken dish! Split each chicken breast through the middle to make 2 pieces. Place plastic wrap over them and pound each one flat using a meat tenderizer/mallet until they are about a quarter inch thick. Season a good amount of salt and pepper on both sides of each piece. Place seasoned flour on a plate and and dredge each piece of chicken in it. Heat the oil over medium-high heat and when the oil is hot fry each piece of chicken for 5 minutes on each side until they are golden brown (this may require you to do this in 2 batches). Remove chicken from pan and arrange in a single layer in shallow ovenproof pan carefully soak up any remaining oil with paper towels and discard.. Put in low oven (275-300 degrees) to stay warm. Add 2 tablespoons butter onion and garlic to skillet and saute (do not brown) for a few minutes until soft. Add mushrooms and saute about 5 minutes making sure to season them with salt and pepper lightly. Add marsala wine & chicken stock about halfway through. Use slotted spoon to lift mushrooms out of skillet and arrange on top of chicken breasts. Sprinkle with cheese and put back in oven until you finish next step. Add cream & parmesan w/ 4 T butter allowing the liquid to boil rapidly until reduced by half. Remove chicken from oven and pour wine mixture over the chicken and serve. Served with rosemary mashed potatoes. 4-6 russets, 1/4c cream, 1/4c butter, 1/4c whole milk. Steep with 1 sprig rosemary. 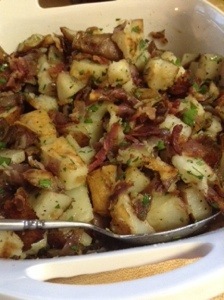 When drain potatoes-add cream mixture and 1 sprig minced rosemary. 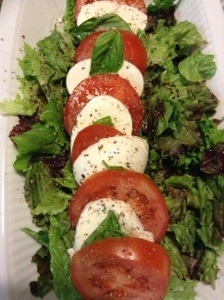 How does your family celebrate the cuisine de Italia? Ten years ago this school year, I left the house in my new suit and heels for my first day of school on the other side of the desks. I was young, a new graduate, and I needed to support my husband and I while he went to school for his dream career. I loved school so much, I figured teaching would be a good fit. I must have been right because eight years later, I was still in the classroom, but longing to be home with my babies. This morning, I began my ninth year of teaching. I wore flip flops and shorts, and no one cared. I started class a few minutes late so I could squeeze in a morning workout, and there were no reprimands. There were no bells, no jammed lockers, and no buses to flag down at the end of the day. We talked about God, read the Bible, and no one objected. The students asked questions and we paused for discussion until intrigue was satisfied. 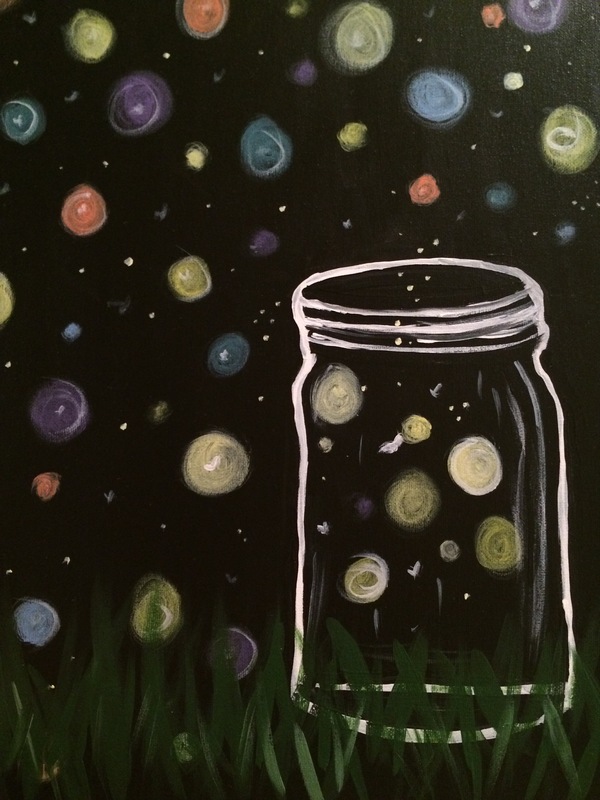 I listened to my kids play, read, and run around in the backyard. I had time to prepare for tomorrow and still make dinner fresh from the lease. 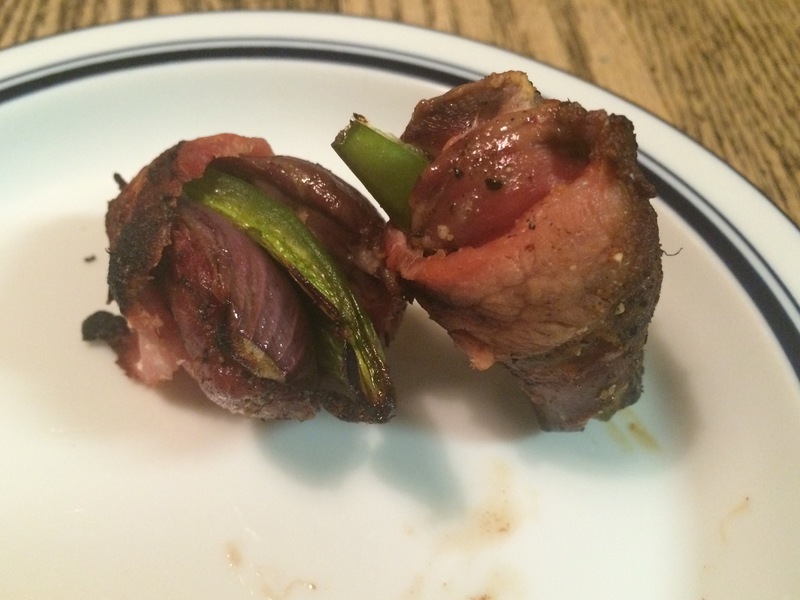 Dove en Brochette, from Texas Monthly Bacon Wrapped Dove (adapted since Man doesn’t do cream cheese y’all), game advice from Those doves you bagged are tasty, if you cook them right. Happy America Day! I must admit, I love seeing all the red, white, and blue, watching fireworks, and spending a long summer day with my family. Over our brief history, The USA has undergone many changes, and this week has left me a bit nastaglic about the pride, honor, and dedication of so many Americans in that history. We are so thankful for our military and their families, and so blessed to live in a country that offers so many freedoms and liberties. Let us never lose sight of that. 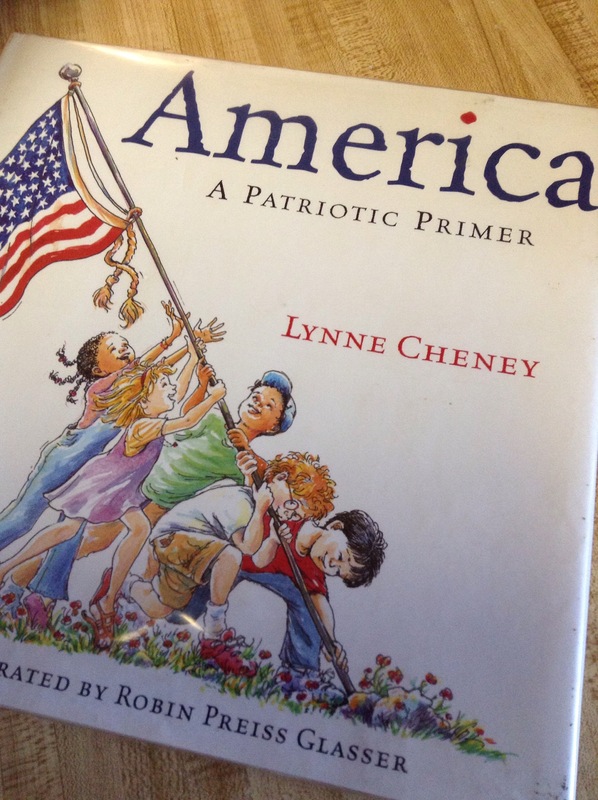 Speaking of patriotism, try this amazing cute & informative book out with the kids. 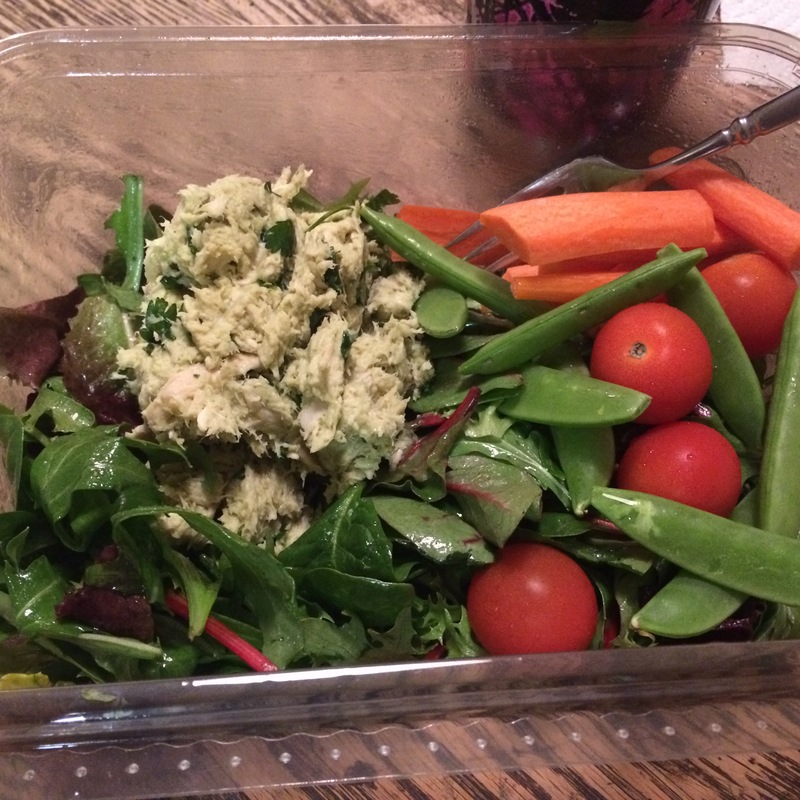 Now…on to food. Cause we all know that’s most important. Wink, wink. Sometimes even the classics need a little tune up. My basic lemonade recipe with bouncing berries floating along side thyme sprigs. optional: splash of ginger ale, sparkling water, your fave vodka or rum. Blend, pour into glass & sip lazily. I fiddled with this version from The Cozy Apron and oh, goodness it’s good. In family of Germans, warm potato salad with a vinegary kick is nothing new, but the crispy garlic and lack of sometimes overpowering mustard make this version stellar. 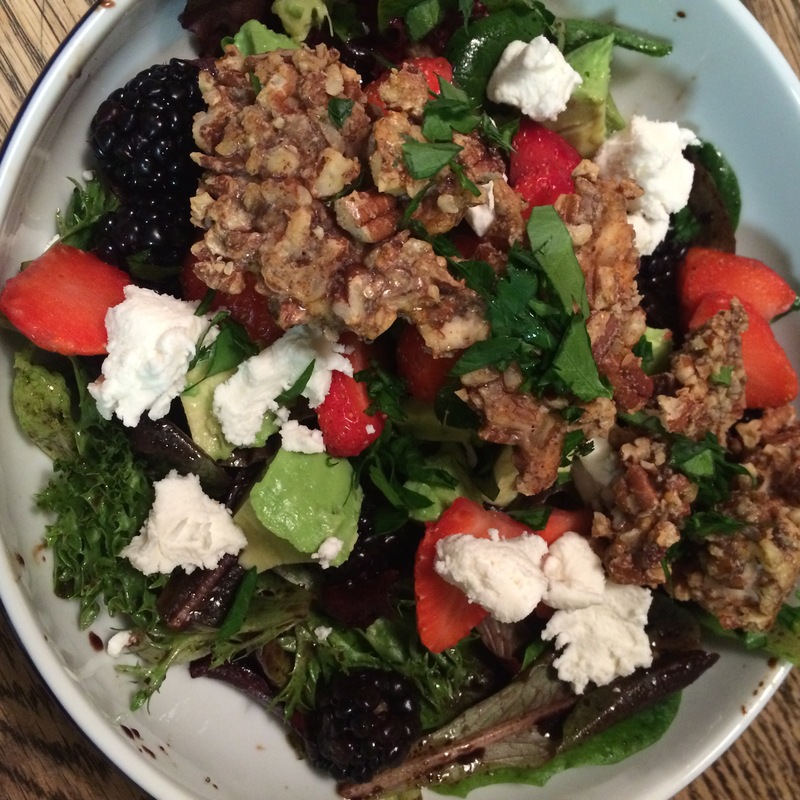 A healthy spin on a BBQ favorite. Roasting the ingredients offers a super punch of taste in this simple recipe. Preheat oven to 400 degrees. Line two sheet pans with foil. On one, line up four to six slices of bacon. 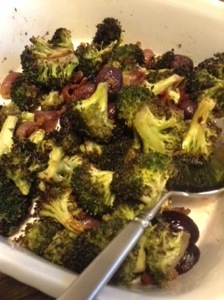 On the other, mound broccoli and grapes, drizzle olive oil, salt & pepper. For extra flavor, toss on some garlic and chopped red onion to roast with broccoli. Roast for about 20 min, turning bacon about halfway through cooking. Remove bacon, drain, and crumble. Cool other components briefly on pan, toss all together, and add shards of sharp white cheddar or parmesan cheese. Dress with additional oil and s&p if desired. Serve hot, cold, or at room temperature. 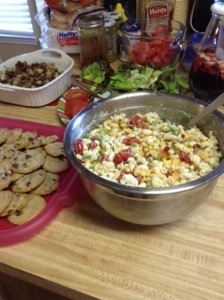 A hold over from my younger days, this macaroni salad is made without mayonnaise — making it pleasing to almost everyone. Prepare macaroni according to package directions; drain and rinse briefly. Puree the cottage cheese until smooth. Add in the vinegar, yogurt, oil, herbs (except basil), salt and pepper, and pickle juice and mix thoroughly. In a large bowl, combine macaroni with dressing. Allow to refrigerate a couple of hours. 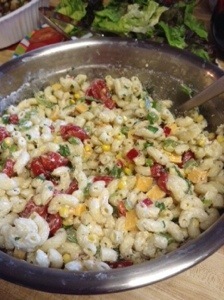 Add in corn, tomatoes, green onion, basil, and cubed cheese before serving. 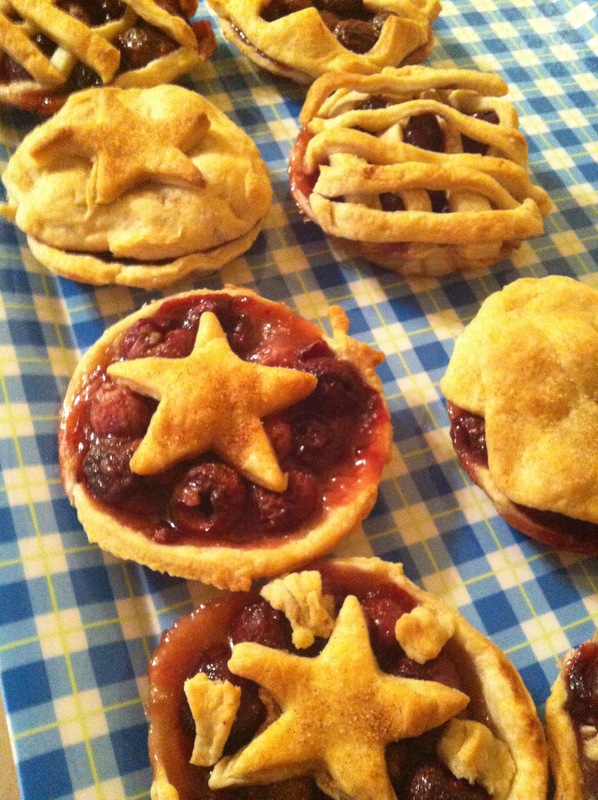 Round out the meal with a summer classic, the cherry pie. We made mini ones so everyone could grab & go.